The Darkest Tool is a paranormal thriller full of suspense and mystery. This novel is told in turn by two narrators: Jonathan Night and his guardian demon, Arioch. Angels and demons have been at war since Lucifer led his rebellion to God’s throne. Bound to Earth and darkness the demons manipulate man to expand their realm. Jonathan is unaware of his purpose as he is shaped and guided by Arioch’s unseen hand. 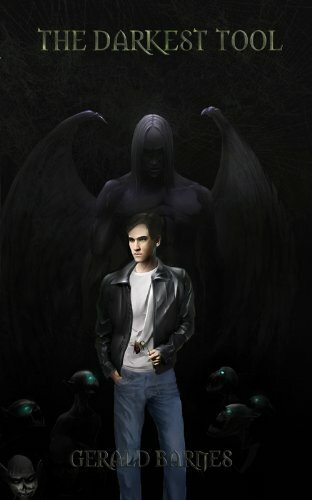 Through dreams and darkness Jonathan is stimulated to ensure his destiny as the savior of the fallen. Through Arioch we see the fall of Lucifer and how angels became demons. This is a story of lost love and regret. This is a story of rebirth and evolution. I always wanted to write a novel. I was suffering my reoccurring nightmares and instead of wasting those “memories” I put them on paper. My writing started out as mostly therapeutic but once all the characters showed up the story took over. I got with my editor, Allison Itterley, and with her help the story came to life. The characters came to life through the dialogue. I knew that they needed to be in the story and let them guide me. This is not an easy question to answer. They came from the story and I just tried to let it happen. A couple characters were deleted in the final edit and combined…it was cleaner that way. Gerald Barnes lives in California with his wife, son, and two dogs. When he is not writing he runs the rat race to provide for his family. He likes to BBQ by the pool and hang out on Lake Shasta. Barnes is currently working on his next book that should be released by 2014.